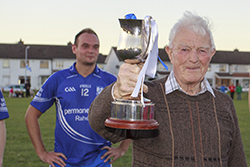 The GAA was formed in 1964 and was originally called Edenmore Gaels, it all began when Tom Marrow approached Des OâNeill with a view to establishing a GAA club within the newly constructed corporation housing estate that was Edenmore. Tom and Des shared their aspirations and plans to form a GAA club with neighbours and friends and subsequently got the backing of a number of people from the locality who fully supported the idea and as a result of two menâs dreams a new GAA club was born. The first committee comprised of Mick Fatherty, Christy Crawley, Wally Morris, Nick Kane, Billy Gorman, Fr John OâConnell, Tom Marrow and Des OâNeill. The first committee meeting was held in the garage of Mick Fatheryâs house on Glenwood Road. One of the first school teachers in the boys school, Jackie Coyne helped with the recruitment of players for the new club the bond between the club and St Malachyâs BNS continues to this day. The new club needed a pitch to play games, in the early days the first matches where played at the side of the site of the newly constructed church with members often having to level out the pitch before games with shovels, Edenmore as a housing estate was still under construction at the time. The club also used a plot of land situated off the Tonlegee Road for matches, the plot was beside where the cinema is now located (Odeon). Some of the first players to play for the club where â Tony and Derek Askins, Brenda Wall, Nick Kane Jnr, Noel Reid, Johnny McGovern, Paul Kelly, Mossie Lyons, Eddie Grange and the OâLoughlin brothers. The GAA club changed its name to St Monicaâs in 1968 after the name of the new parish church. It was around this time period that Des OâNeill met Terry Monahan in Clontarf Orthopaedic hospital, Terry was looking after the hospital aviary at the time. The men where soon to become friends with both sharing a common interest in GAA, soon after the friendship was stuck up between the two men Terry would become a member of St Monicaâs GAA club. Terry would go on to play a major role in the clubs growth and development. It was becoming essential that the club secure a pitch within the area that the club could call home. Des and Terry approached the then Parish priest Fr Foley about using the land located on Millwood Park (back of boys school) as a pitch for the club. The vacant land had been ear marked as a potential site for a secondary school. Fr Foley told the two men âpossession was 9/10âs of the lawâ â the next day the posts went up and the âback pitchâ became and still to this day is the home ground of St Monicaâs GAA club. In those fledging years the club had no dressing rooms with players having to tog out at the side of the pitch or in cars. Terry Monahan approached the principal of the boyâs school and with the help of teachers, Pat Finn, Eamon Dowling and Denis McCarthy a shelter in the boyâs school yard was converted to into a dressing room. With tremendous work and commitment of a number of hard working committee members and club volunteers over the years people like, Tony OâReilly, Paul Kelly, Philip Reid, Shay Byrne, Harry Cavanagh along with Des OâNeill and the late Terry Monahan oversaw the development of St Monicaâs GAA club. In August 1993 St Monicaâs GAA club opened the doors of their club house this was a major achievement of a small Junior GAA club. The club house which boasts four dressing rooms, committee room and a bar would become the foundation of the clubs further development. 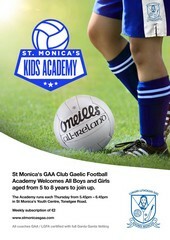 Like all GAA clubs St Monicaâs has enjoyed success and defeats over the years on the playing fields. In 1983 St Monicaâs won the hurling FÃ©ile division one title beating St Vincents in the final. In 1987 St Monicaâs won the Junior football championship beating St Brigids in the final in a cold and wet Parnell Park. In 1989 the Ladies of St Monicaâs were crowned Dublin senior champions following a one point victory over Robert Emmets. In recent times the girls of St Monicaâs have been the leading light in the club, following success at Juvenile level including back to back U15 and U16 championship wins in 2012 and 2013 along with U12, U13 league and cups wins. A number of St Monicaâs players have donned the famous sky blue jersey of Dublin - Sean Barry was full back on the Dublin minor team that won the All-Ireland in 1984. Julie Kavanagh, Veronica Trehy, Siobhan Bissett and Karen McCabe where part of the Dublin ladies team that won the Junior All Ireland final in 1989 with Julie Kavanagh being awarded an All Star in 1991. In recent times, Phily Kelly has presented Dublin at U21 hurling and Junior football and in 2013 Louise Whelan was a member of the Dublin Ladies U16 team who won the Leinster title only to lose out to Cork in the All- Ireland final.